Click on image for this site. Images reporduced with the permission of Maximilian Forte. Amerindian peoples have existed in Trinidad for as long as 6,000 years before the arrival of Columbus, and numbered at least 40,000 at the time of Spanish settlement in 1592. All of Trinidad was populated by several tribes, Trinidad being a transit point in the Caribbean network of Amerindian trade and exchange. Amerindian tribes were referred to by various names: Yaio, Nepuyo, Chaima, Warao, Kalipuna, Carinepogoto, Garini, Aruaca. Amerindian words and place names survive into the present: the Caroni and Oropouche rivers; the Tamana and Aripo mountains; places such as Arima, Paria, Arouca, Caura, Tunapuna, Tacarigua, Couva, Mucurapo, Chaguanas, Carapichaima, Guaico, Mayaro, Guayaguayare; flora such as cassava, maize, cacao, tobacco, and fauna such as manicou and agouti. Trinidad's Amerindians formed part of large regional island-to-island and island-to-mainland trading networks; the Warao of Venezuela, who still exist, were frequent vistors until only recent times. The Amerindians developed the canoe, the bow and arrow, and the ajoupa. Amerindian cuisine is enjoyed by many Trinidadians: Cassava bread and Farine; Warap; barbecued wild game; corn pastelles; coffee; cocoa; chardon beni. The Amerindians also gave Trinidad and Tobago its first major rebellion in the name of freedom: the Arena uprising of 1699, led by Chief Hyarima. In 1783 Trinidad's Amerindians were displaced from their lands to make way for the influx of French planters and their African slaves. In 1759 the Mission of Arima was formed, consolidated and enlarged in 1785, and the Amerindians were to have had control of 2,000 acres of land. A number of tribes were pressed into Arima, mostly Nepuyo, and generically referred to as either "Caribe" or "Indio" -- Arima was the last Mission Town. Parang, utilizing both Spanish and Amerindian musical instruments, emerged from the evangelization of the Amerindians. The Caribs in Arima , converted to Catholicism, were led by a Titular Queen. The histories of major towns such as Arima and Siparia, two large former Amerindian Mission Towns, have given us Trinidad's two oldest festivals: The Santa Rosa Festival of Arima, and La Divina Pastora in Siparia. 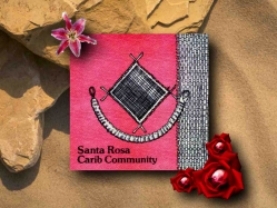 The Santa Rosa Carib Community is the last remaining organized group of people identifying with an Amerindian identity and way of life. At least 12,000 people in Northeast Trinidad are of Amerindian descent. The Amerinidians by Kim Johnson. August 1, 1998, on Calvary Hill View Park in Arima, Trinidad. and the copyright belongs to the Santa Rosa Carib Community.